This is a first-of-its-kind, free event where veteran-owned and service-disabled veteran-owned small businesses (SDVOSB) can learn, exchange ideas, network and market their products and services to supplier diversity corporations, federal government agencies, and prime contractors. Hear first-hand how to do business with these entities and share what your business can do for them. 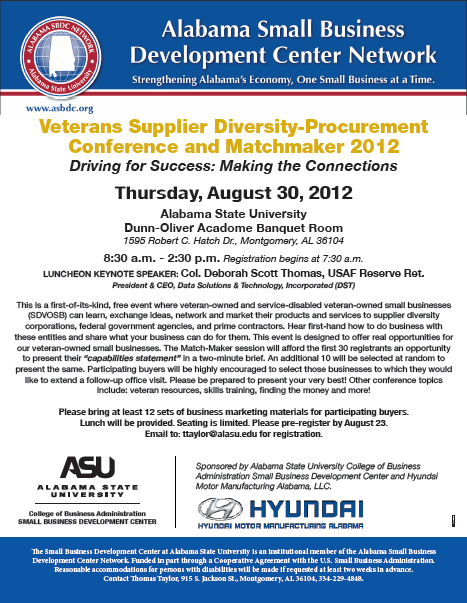 This event is designed to offer real opportunities for our veteran-owned small businesses. The Match-Maker session will afford the first 30 registrants an opportunity to present their “capabilities statement” in a two-minute brief. An additional 10 will be selected at random to present the same. Participating buyers will be highly encouraged to select those businesses to which they would like to extend a follow-up office visit. Please be prepared to present your very best! Other conference topics include: veteran resources, skills training, finding the money and more! Please bring at least 12 sets of business marketing materials for participating buyers. Email to: [email protected] for registration.